Installation view of “Cities of Conviction” at UMOCA. My dad told me a story once, from his childhood in Kansas. This kid lost all his money at a carnival, pitching rings at the necks of Coke bottles, trying and failing to win a prize for his sweetheart. The carnie, not content to take the kid’s farm wages—during the Great Depression, no less—called him out: “You FOOL . . . you CAN’T win!” So the kid went home, built his own ring toss, and spent the winter practicing every night after chores. When the carnival returned the next summer, he cleaned out the crooked game and shared stuffed animals and Kewpie dolls with everyone. I remembered that folkloric hero as soon as I entered UMOCA to check out Cities of Conviction, an exhibition of Saudi Contemporary art currently touring the United States. Like most Americans, I haven’t seen a lot of great Saudi art, but despite any doubt I may have felt, the first fist-pumping, say YES! piece I encountered stood only a few feet from the front door. “Asylum of Dreams” is an interactive crane-machine game, found and modified by Qamar Abdulmalik, that elicits a variety of sensual and cerebral pleasures, followed a moment later by stinging realizations. Behind the unbreakable windows of a game that beckons seductively wherever working men and women shop lies a trove of colorful prizes. Here, though, instead of toys or electronics, something far more valuable: passports from the US, UK, Canada, and other portals to an almost inaccessible new life. But then, connected realizations tumble: the name blazoned across the top of the machine—GRAB-N-WIN!—suggests that luck, rather than merit, determines the fate of those stateless wanderers who play for real. The ruthlessly honest will admit that their own passport, and the privileges pertaining thereto, are unearned in any meaningful sense. The grab-n-win’s color scheme, red and black, subliminally suggests some ominous consequences for playing. Worst of all, don’t we learn soon enough that these games are rigged to be almost unwinnable? The slippery claw that always seems about to snag the coveted prize becomes a metaphor for the tiny number of visas boasted of by governments whose borders represent survival for millions of refugees. The essence of any great game is metaphor: that behind the challenge and fun of playing lies—in this case, festers—a truth of human fate too harsh to contemplate directly. Everyone knows the cliché: you have to suffer to make great art, which could explain why significant Contemporary art from Saudi has yet to become well known. Arabia not only sits on a significant percentage of the world’s oil, but constitutes the spiritual heartland of well over a billion Muslims, each of whom turns five times a day to face in its direction. If the essence of Contemporary art is firmly associated with an activist practice, often subversive even when its goals are positive, then when it comes to the struggle for human rights, concern for the Middle East could be consumed entirely by the unimaginable suffering of displaced Palestinians, Iraqis, and now Syrians, compared to whom the Saudi people seem well-off, living between a Red Sea moat and a buffer of desert sand. But of course that’s only ignorance, compassion fatigue, or a failure of imagination speaking. In any event, if Cities of Conviction is anything to judge by, no such lack of imagination has befallen Saudi artists, 19 of whose revelatory works are on display at UMOCA from now until Jan. 6, 2018. Graphic design has been the root of Muslim culture since the days when it was forbidden to mock—meaning depict—the creations of Allah, so “arabesques” and other abstractions in calligraphy, fabrics, and architectural tile became universal ornaments. Here as elsewhere in Contemporary art, then, artists call to mind, respond to, and react against these fundamental prompts. Virtually everything in Cities of Conviction refers in some way to these traditional forms. 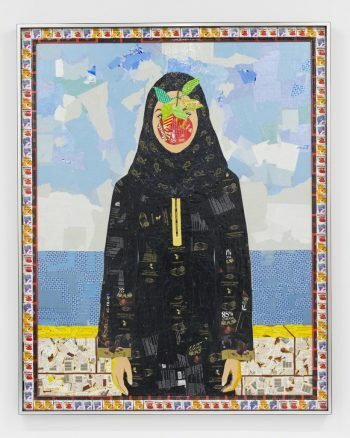 Yusef Alahmad blends a counterculture prop, the skateboard, with Arabic calligraphy in a deliberate attempt to back viewers minds away from media images of terrorism and war and substitute a contemporary, more friendly association. Musaed Al Hulis makes his prayer rug of bicycle chains, linking the sensuous comfort and infinite renewability of textiles past with one of the most positive symbols of modern mechanics, a paragon of democratic transportation and energy conservation. Abdulnasser Gharem plays with the universal presence of written signs, here connecting backwards-facing printer’s type with an essential character of Arabic: that it is written from right to left. That same habit of mind, sans the actual letters but presumably just as powerful, informs Ahmed Mater’s “Evolution of Man,” in which a graphic image of a gasoline pump and an X-ray of a man pointing a gun at his head morph into one another as the viewer scans back and forth. Which is better . . . left to right, or right to left? Both make equal sense, and what has come to seem natural and proper is revealed to be no more than a convention. One of the more literal, and effective, uses of calligraphy shines from Nasser Al Salem’s EKG heart monitor, repurposed to present “Guide Us Upon The Straight Path,” in which a scriptural call for the faithful to stay on the straight and narrow plays across the monitor, then transforms into a warning of the consequences of failure when it finally flatlines, a threat familiarized but not diminished by its popular use in entertainment. The tiny, glowing monitor may be the smallest work in the show, but Al Salem’s desire to convey sincere religious feeling through scriptural citation is also evident in “They Will Be Seen Competing in Constructing Lofty Buildings,” his monumental work that towers over the gallery. Adjacent to it, in “Heaven’s Door” Rashed Al Shashai takes his audience on what must be one of the longest journeys ever taken between source material and completed work. The feeling engendered by his “stained-glass” windows contrasts utterly with the irreverence so often characteristic of Contemporary Art, and these artists come close to sentiments and strategies familiar to UMOCA’s audience from some in Utah’s LDS arts community. Near Ahmed Mater’s two-dimensional, schematic gas pump, but utterly unlike it, Khalid Zahid’s “Beginning/End” presents an “exploded diagram” of a pump’s customer interface in three actual dimensions. As its obsolescent, disconnected dials spin on meaninglessly, they become a reminder of how fast the end of petroleum dependence approaches. 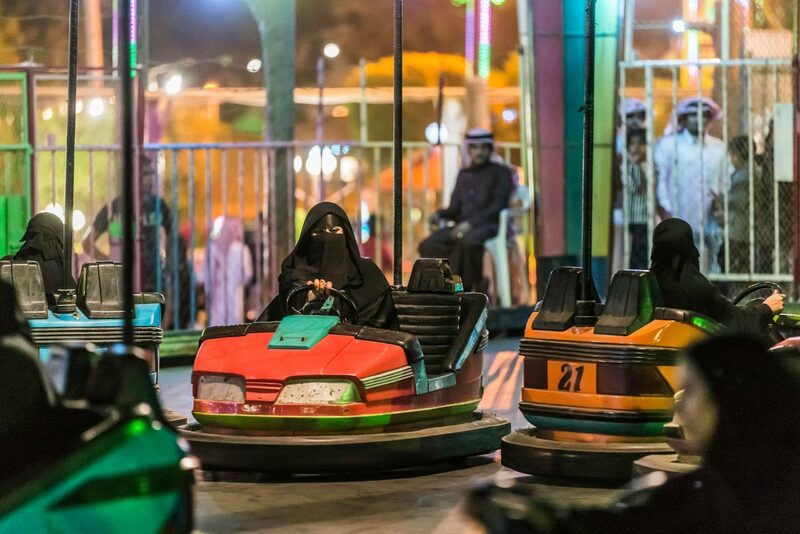 A very different reference to cars comes through Arwa Alneami’s “Never-Never Land,” photographs and video shot secretly in Saudi amusement parks in order to reveal a secret, uncelebrated part of the culture. Contemplating these images of black-shrouded, anonymous women whose postures alone demonstrate paroxysms of pleasure, viewers may be satisfied with the irony of those who cannot legally drive tearing up the bumper-car ride, or go on to consider the narrow path so many governments navigate between what they would sooner forbid and what their populations will not forgo. Here, in Utah, we see a culture that universally bans alcohol, its image housed for now in a State in conflict between the moralist’s condemnation of strong drink and the efficacy of the taxes it can raise, the good works vice can do. “Never Never Land” (frame capture), a 2014 video by Arwa Al Neami. Courtesy of the artist and Pharan Studio, Jeddah, Saudi Arabia. In fact, in an effort to convince UMOCA’s audience that this art is more familiar than they expect, curator and catalog make much of the similarities between Saudi and LDS societies. Circumstantially, both are desert nations, at their cores centers of religious history and activism. More specifically, they may share horses, veils, and so forth. But the effort to draw parallels breaks down, either because the dogmas, while similar in impact, diverge in details, or because the existential goals of religion keep dogmatic principles close to universal facts. Gender prejudices, to take the most significant example, are denied in Utah and throughout the United States, yet are widely practiced according to ineradicable convictions that masquerade as facts, while their staunch enforcement and inflexible defense by Muslims means proponents of equality at least don’t have to convince anyone that a non-glass ceiling exists. This debatable tactical advantage may explain one of the more remarkable qualities of Saudi art: the lack of feminist opposition to masculine self-expression. Because they don’t have to convince anyone that barriers they experience daily actually exist, Saudi artists are free to skip the first step historically required of most women: that they locate themselves in relation to the double standard. In “Never-Never Land,” one woman seems to pray, while another throws her head back like Bernini’s St. Teresa. That they are shielded from the danger of real cars only to be allowed to drive ones they crash deliberately is ironic, perhaps, but the work has more to do with universally enforced decorum. Nouf Alhimiary’s photos of women held under water, yet refusing to drown, make no specific reference to sexist imposition; instead, they paradoxically celebrate what the women in them have made of their predicament, even as they leave the viewer somatically, rather than cerebrally, gasping for breath. More than a third of these artists are women—but telling which requires searching the texts’ pronouns. The women’s work is as good as the men’s, and often more fulfilling. A veteran collector who chooses to decline the mechanically assisted media that characterize Contemporary art (digital, video, etc.) in favor of traditional demonstrations of craft didn’t hesitate to choose Lina Gazzaz as best-in-show. Her ink, watercolor, and pastel images can be apprehended instantly, and then reward endless contemplation as they open in the mind like hallucinatory hothouse flowers. I went away and forgot you. A while ago I remembered. I remembered I’d forgotten you. From a distance, I thought the image a cliché: a solitary woman in a long, empty room, dressed in black, methodically sweeping the floor. Only as I approached could I see what she was sweeping up. It was her past, the love she’d made, a life she had created and could no longer live. When creativity is suppressed for a long time, what remains visible may be only the proverbial tip of the iceberg, while the eventual release of ideas and gestures compressed almost to bursting can be explosive. So Ghada Al Rabea has produced deceptively decorative artworks that simultaneously—because paintings have to happen all at once, or at least contain in one static instant all they will bring the viewer—sum up the history of modern painting, celebrate it, demolish it, and then climb, as art must always do, upon the shoulders of those who went before, only then setting off to navigate the new world that must be created. “Bint Al Rijal” belongs to a series of her paintings that exploit representational art’s unique ability to present an image while simultaneously questioning it—visual sabotage made possible so long as we know the subject prior to seeing its image. Each of her candy-wrapper collages invokes and playfully disrespects a previous artist, sometimes working with a well-known face like Frida Kahlo’s, other times with an artifact like the apple borrowed from Magritte to float in front of the face of Bint Al Rijal, and sometimes borrowing wholesale: “Basra,” not on exhibit here, transforms two of Cezanne’s card players into desert tribesmen who seem, if anything, closer to the French master’s original intentions. Each is also a colorful, richly textured — maybe the right word is “eye-popping” — original scene, ready to spar with a new audience on their own terms. 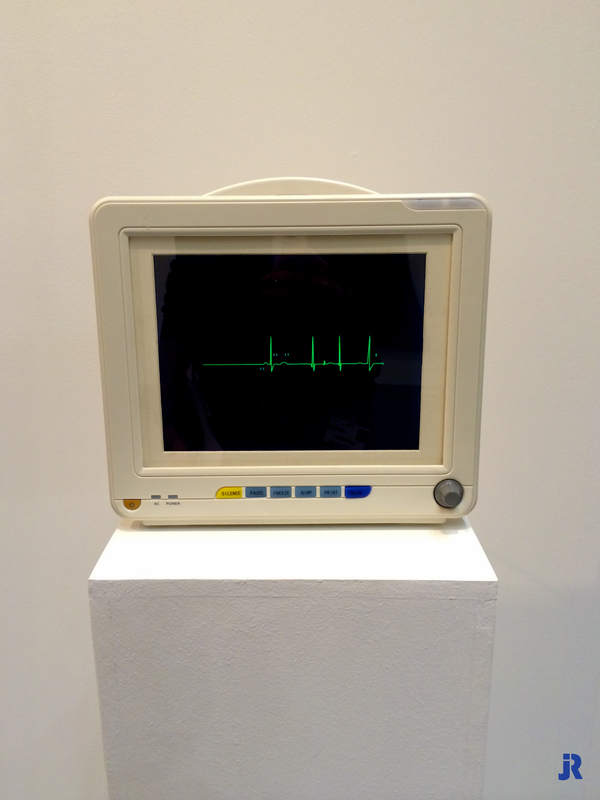 I am loath to beat around the bush, and suggest or imply that Saudi art has the potential to overtake the shallow, mainstream attempts we talk about more than enjoy: the money-and-status-driven work that increasingly fails to satisfy, or even engage, the human need for real art. I want to come right out and say it. 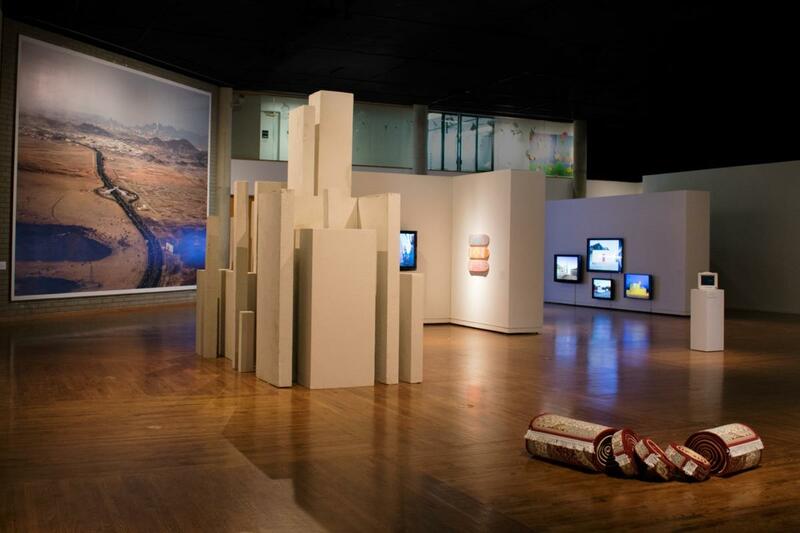 Cities of Conviction, contemporary art from Saudi Arabia, UMOCA, Salt Lake City, through Jan. 6, 2018.